When Manuel Villacorta was growing up in Peru he always had a healthy relationship with food. But everything changed when he came to America and started to adopt new eating habits. When his diet spiraled out of control he was instinctively drawn back to the way he ate as a child. Eating Free is a holistic weight loss program that is the result of these experiences and his work as a dietitian. In Eating Free, Villacort reveals how a hormone called ghrelin influences our hunger and appetite. He asserts that the key to successful weight loss is controlling ghrelin, not restricting carbohydrates. He recommends a diet based on a formula of 45 percent carbohydrate, 30 percent protein and 25 percent fat. This ratio works to keep ghrelin levels in check while allowing you to enjoy “forbidden” foods (pasta, potato, rice, and chocolate). This way you won’t feel deprived and your cravings will stay under control. Readers are offered a choice of four different seven-day meal plans at 1200, 1400, 1800 and 2100 calories. Guidelines are provided to help you choose the calorie intake that best suits your needs. Villacort says that it is not beneficial to obsess on the scale every day. Instead he suggests controlling ghrelin with weekly check-ins regarding your weight, diet, stress levels and sleep. When you give your body what it needs on a weekly basis you can afford one or two minor “slip-ups” and still lose weight. He offers a free online tool to make it easy for you keep track of the lifestyle factors influencing weight loss. Steel cut oats, noodles, farro, rice, whole-wheat bread, quinoa, sweet potatoes, beef, lean pork, chicken breast, salmon, shrimp, black beans, cannelini beans, hummus, banana, cauliflower, zucchini, red pepper, onion, tomato, spinach, walnuts, low-fat cheese, Greek yogurt, olive oil. The ghrelin diet asserts that it is much more important to monitor your nutritional intake than it is to exercise. He even states that exercise can hinder your weight loss because it increases appetite. Exercise is advocated for health reasons but not as a primary method of increasing your weight loss. 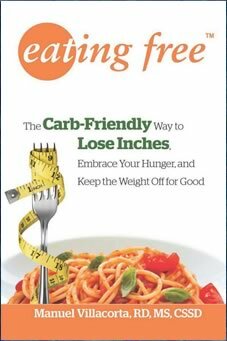 Eating Free: The Carb-Friendly Approach to Lose Inches, Embrace Your Hunger, and Keep the Weight Off for Good retails at $15.95. The program has demonstrated an 84% success rate of weight loss. You can still enjoy foods like bread, rice, potatoes and chocolate. Includes 7-day meal plans for four different calorie levels. Addresses the importance of stress-management and sleep to control ghrelin. Author is a registered dietitian. Meal plans are not suitable for those with intolerances to wheat and dairy products. When eating off the meal plan it is necessary to monitor carbohydrate, protein and fat content of foods. Difficult to eat out and remain on the program. Eating Free is a weight loss program that seeks to control ghrelin and to encourage a balanced approach to carbohydrates in your diet. You will learn to keep appetite in check by consuming a specific ratio of nutrients. This allows you to enjoy your favorite carbohydrate foods in sensible amounts while still being able to lose weight.